Motionwear’s X-Back Bandeau Leotard is constructed so that you look long and lean. 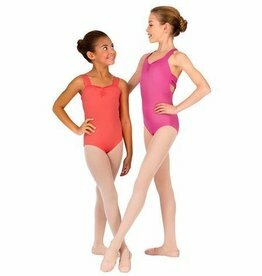 This leotard features clean lines, with a high semi-scoop neck with wide straps that form an X in back between the neck and arm holes. The low, open back flatters the 'dancer ascetic' while staying supportive and comfortable.